As my first 90 in 90 feature in over 2 months, I'm going to feature a great shop that has already returned the kindness by posting about my shop. George McKim has a shop full of gorgeous paintings, collages, lino prints and note cards. This graphics artist actually fills his shop in his spare time. And you're in luck: for today only, you can get 10% off all items!!! How great is that?!? If you know me or some of my past posts, you know that I LOVE flowers. And look at these beauties, all available in GeorgeMcKim's store. The first one you see at the top is called California Flowers, and is a collage made with paint and torn paper. This is so bright and beautiful, I'm amazed really. And inspired... I've never been able to make a collage look more than just pieces of paper glued to page..
Another inspiring piece is this stunning yellow and pink sunflower. This is a print from a linoleum cut, which are characterized by the fine lines and detail. I remember making a lino cut in high school art class ~ you had to carve a negative image of what you wanted to print. It was so much fun! If you browse through this shop, you're sure to find these sunflowers cropping up all over the place! I just can't get over the amount of detail in these pieces! 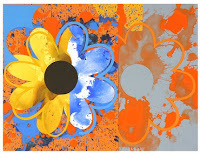 Here is another flower abstraction number 2 that I particularly enjoy. The striking colours really remind me of spring, which seems so far away, and yet imminent since the weather hasn't been so cold, and there isn't any snow here. 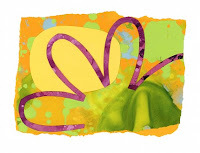 I find that this mixed media collage really speaks of warmer weather: the bright yellow sun beating on the green meadows, gorgeous flowers starting to bloom. I love the spring, almost as much as the fall. I also love the uneven edges of this print, which would look amazing with proper matting and a great frame. See a picture you like but don't really have the money right now? Why don't you ask GeorgeMcKim for a notecard? He'll make them with any image you ask, and you can get one or a pack of 5. 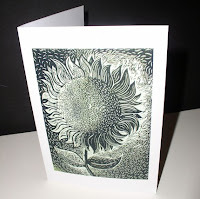 This picture is just an example of a black lino-cut sunflower notecard. You can get more than one colour combo for the sunflowers too, if you wish. While you're browsing these amazing prints, be sure to check out his website and blog!